Barfing up rainbows is glorious! Although, we can't say we've been fortunate enough to experience it. 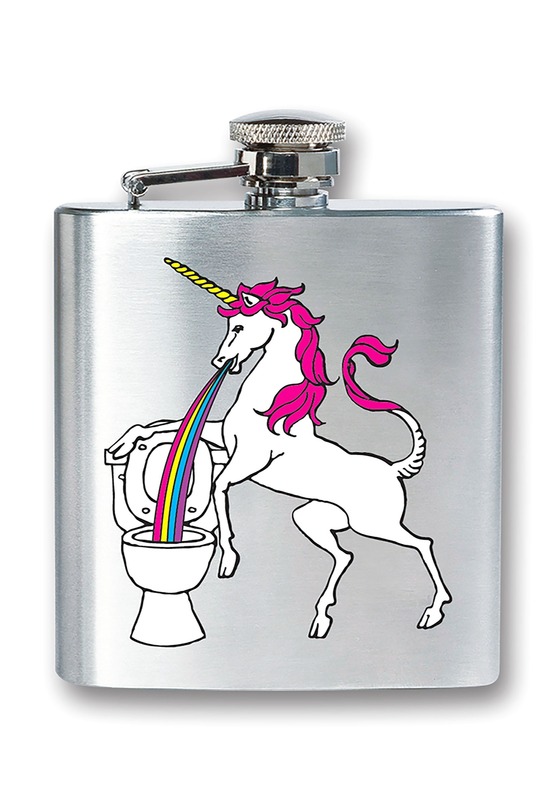 We'd rather not reminisce about our past experiences with vomit; none of them are anywhere close to being described as 'magical,' that's why we have this puking unicorn flask. We live vicariously through it. It's a nice reminder that barf doesn't also mean bad; barf can be beautiful especially when it's coming from an enchanting unicorn. Make a statement at the next party with the unicorn perfect flask, perfect for house parties and other social events. The stainless steel flask is capable of holding 8 oz. of your favorite adult beverage. It has an attached twist-off lid which conveniently holds the lid even when you're taking a swig. Printed graphics on the front feature a majestic white unicorn with a hot pink mane, barfing a rainbow into a toilet. It's glorious! And it also makes a great novelty gift for fans of unicorns... and rainbow barf. Got a thing for rainbow barf? (It's okay to admit it, we totally understand your fascination.) If so, don't forget to check the Gravity Falls barfing gnome mask. Like this unicorn, the gnome is barfing rainbows too!